Announced earlier this week, the Steam version of Resident Evil 4 is atonement for the god-awful Windows port released in 2007. Capcom's released some comparison shots showing off how much better the game looks when the textures don't look like they were painted with mud. 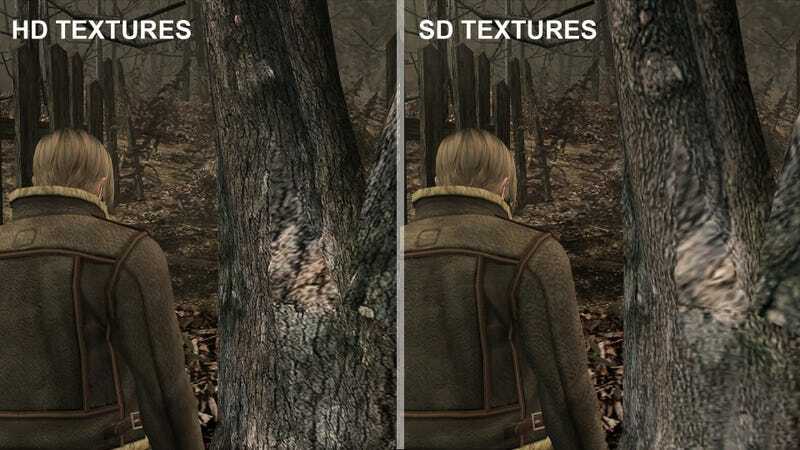 According to a post on Capcom's Unity blog, the SD textures will still be in place when the Steam version of one of the best Resident Evil games drops on February 28, giving players the ability to switch between them on the fly. I'm guessing that's a feature that will only be used once for the novelty value, because ugh. Oddly enough, some of the SD textures seem to feature a little more detail than the HD ones. Check out this fence, for instance. The SD version features all of these nifty little scuff marks, like something's been scratching at the wood. Here's a couple full shots to give you a better idea of the difference. Capcom also released a couple of shots showing the game running at 2560x1600 resolution, for those of you with ridiculous monitors.